If you are currently looking to rent a party bus and you reside in the Dearborn MI area, then your search has finally come to an end. Here at Rockstarz Limousine and Party Bus, we specialize in providing our clients with an amazing experience from start to finish allowing them to celebrate their occasion in a unique environment. When on the lookout for a party bus in Dearborn, you will see that you do have different options, but allow us to tell you why we are the best. Not only will you have a fully professional driver, but you will also have ample room to accommodate a number of guests who will be able to party the night away. Furthermore, the leather seats that we have installed will provide you with the chance to rest your feet while everyone continues the party in front of you. When it comes to our Dearborn party bus rental service, you will also be given access to our stunning stereo sound system that has the effect of turning this bus into a real moving nightclub. Not only that, but we know that atmosphere is everything, which is why we have also included an amazing laser light display that just gives things that extra bit of a spark. 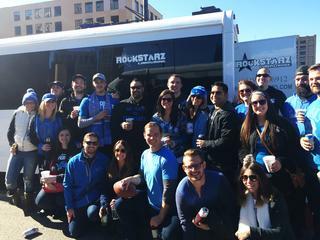 In the past, individuals have used our Dearborn party bus service to celebrate a number of different occasions, and we have the ability and experience to accommodate your various needs. This can vary from a birthday to anniversary to a bachelor or bachelorette party and the choice is really up to you. So, if you do live in the Dearborn area and are seeking a party bus, then give us a call here at Rockstarz Limousine and Party Bus. Alternatively, you can contact us via our website and a member of our team will be in touch as soon as possible to ultimately discuss your requirements.